Huge pumpkin that holds the world record at the Topsfield Fair wins, the “Giant Pumpkin Weigh-Off,” in this photo from 2007. 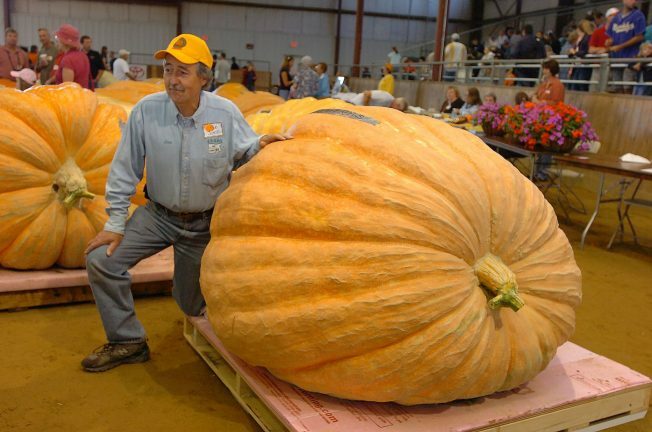 The pumpkin weighs 1,689 pounds. A Rhode Island man has won the prize for the heaviest pumpkin at the Topsfield Fair in Massachusetts with a fair record 2,114-pound gourd. The Salem News reports that Ron Wallace won the Topsfield Fair's All New England Giant Pumpkin Weigh-Off on Friday for the third time and took home a prize of more than $8,500. Wallace, who lives in the Greene section of Coventry, Rhode Island, also won in 2006 and 2009. Wallace says Topsfield is one of the top weigh-ins to win. Dan and Holly Boyce of Benson, Vermont, came in second place with a 2,017.5-pound gourd, and received a $3,000 prize. Scott Marley, of Bellingham, placed third and received a $1,500 cash prize with his 1,846.5-pounder. The Topsfield fair dates to 1818.